Areas Served: Ada, Cascade, Grand Rapids Township, Grand Rapids, East Grand Rapids, and Kentwood. Need help with all those leaves? 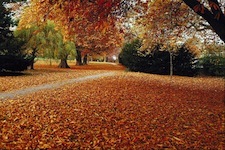 Grand Rapids Landscape Management Leaf Collection Service is here to help. We’ll help you blow the leaves from your yard, bushes, shrubs, and the rest of your landscape and remove them from your yard. It saves you the time of ranking, dragging, and bagging all those leaves! If you’re looking for someone to pick up all the leaves you’ve raked or blown, our leaf removal team will pick them up. If you need more help than that, we can help you with fall clean up by blowing leaves from your landscape and removing them from your property. You don’t have to be a regular weekly client of Grand Rapids Landscape Management. Our Leaf Collection Services serve primarily Grand Rapids, Grand Rapids Township, East Grand Rapids, Ada, Cascade, and Kentwood. If you need help, give us a call or send us a note. Parking Lot a Skating Rink? We can Help!